Kate Chen is the communications manager for the Western Academy of Beijing (WAB). She recently wrote an article about the school’s co-founder, Michael Crook, for WAB’s newsletter, Lianxi. She recounts Crook’s fascinating January 18 “fireside chat” about his family’s long history with China, as well as the past, present, and future of WAB itself. WAB Co-Founder and Board Member Michael Crook gave what can best be described as a “fireside chat” to a captivated audience of WAB parents and staff. Though minus one actual fireplace, Michael’s charming and extraordinary vignettes from his past transformed WAB’s Lotus Lounge into the coziest of fireside settings. His stories were further brought to life by his accompanying slideshow of old black and white family photos. Though the images were shown via laptop, projector, and PowerPoint, I swear I could hear the “kir-chunk” of an old slide wheel shifting frames. It is no surprise that Michael Crook has made a life for himself in international education in China. Michael descends from long line of pioneering missionary educators who ventured from their Western homelands to China a century ago and established flourishing families and careers. 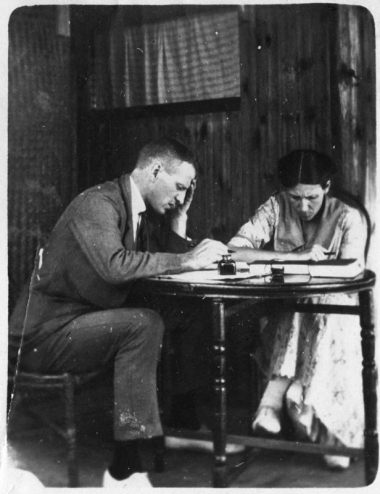 Michael’s grandmother, Muriel Brown, and her sister came to Chengdu, China as Canadian missionaries in 1912. The Canadian missionaries had decided that the best way to support the Chinese people was through the establishment of clinics and hospitals, and schools and universities. Muriel Brown founded the Dewey School – their first school in China, the first of many, in Chengdu in 1915. 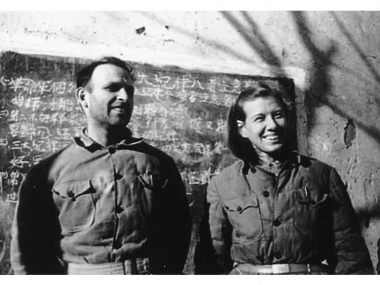 During that same period, Michael’s grandfather, because of his rare fluency in both the English and Chinese languages, was recruited to work with the Chinese labor corps in Europe, where he worked to promote literacy within the Corps. The family photos of Muriel and her sister in China in the early 1900s are extraordinary. Images of the two entirely proper, well-dressed Western women, strapped into bamboo backpacks (see Michael’s great-grandmother Sophie on the right) or riding in early pedicabs, hiked, pulled, and carried by local Chinese men through rural China, illustrate remarkable pieces of not just Michael‘s family history, but of China’s. These two women with grins and petticoats profoundly altered the course of education in China. Muriel’s daughter – Michael’s mother – who is 96 years old now and living on the west side of Beijing, carried on the tradition established by her parents. After completing studies in both education and anthropology, she decided that her interest laid in studying the native people of China. Because men and women in China at that time had little interaction, she knew it would be quite impossible to gather anthropological information through traditional interviews; she would be unable to speak with the men. Understanding that getting the Chinese women to talk to her would be her only hope of gathering societal information, she used her education training to open a nursery school. In addition to educating the children, the nursery school also congregated the Chinese women who hung around the school and chatted over tea, providing ample material for the listening anthropologist. Michael’s parents met in China in the 1930s during the war; they were asked to teach English to a couple dozen students in a school and continued to teach in Beijing after the “liberation.” The school still exists today – the well-known Beijing Foreign Studies University. The family raised and educated Michael and his two brothers in Beijing. Michael also completed some of his education in the UK, hence the dashing British accent. He is both proud and correct to proclaim that he and his siblings are “truly bilingual and bicultural.” One has only to hear Michael speak, in his equally flawless English or Mandarin, about his life in China, past and present, to understand just how right he is. At the time of the Cultural Revolution in China, Michael Crook was in Peking University’s Chinese secondary school when the military took over. “It wasn’t all bad,” he reports. “Classes were just replaced with military training. My brothers and I had a great time!” His parents, however, did not. His father was imprisoned in 1967 by the Red Guards and was held in the Peking Garrison, and later in one of China’s highest security prisons, for five years. Michael and others held sit-ins and sleep-ins at the Garrison, pressing the Red Guard to release of his father. “But they wouldn’t, of course.” His mother was also imprisoned for the middle three years of her husband’s five. Of course, Michael could not possibly speak to a WAB audience without sharing some of his experience as one of the founders of WAB – and someone who is still integrally involved. Michael generously shared many charming anecdotes from WAB’s early days and a few recent ones as well with the eager audience. For example, he remembers fondly WAB’s early years and the “can-do” attitude of the students and staff, who totaled just 178. Unlike today, when our capable facilities staff care for our beautiful campus, 18 years ago, when WAB was still located in an old factory building in Huajiadi, if the school wanted trees, the staff and students got out and planted them themselves. Michael delights in the level of community involvement present at WAB’s inception, present at WAB today, and hopefully always at the core of our school. He recently traveled back to the site of the old school and, although new buildings are on the school footprint itself, the trees that they planted are still there, no longer saplings but each a healthy foot or more wide now. He was asked about the naming of the school, particularly about the use of the word “Western” and the lack of the word “international.” As he explained, when the school was founded, the participating families were of North American and European origins. He didn’t feel it was appropriate to claim “international” status when so much of the world was not represented. WAB has certainly expanded its community since then, now representing some 57 countries around the globe. “International” would now be defensible, but we like W-A-B just fine without an “I”. One of the most remarkable and poignant tales Michael Crook shared, evidencing the truly "full-circle" nature of life, was the fact that when he first went to the Education Bureau in China, some twenty-odd years ago, for approval to open a school called the "Western Academy of Beijing," one of the officials he met with recognized his name. "Michael Crook. You are Mrs. Muriel’s son." That official had been one of his mother’s Chinese students, the one kneeling to the right of Michael in the picture above. And the charter was approved. Thank you, Michael, for sharing a bit of your family’s history and WAB’s, and for being such a generous ambassador of East-West integration. Michael Crook is currently working on a book along with others, Chengdu: My Home, about the history of Canadian missionary families in China – a project which includes many of the family photos.